The last thing I want to deal with as a mom is sick kids. We do our best to avoid picking up germs by washing our hands, reminding our kids not to put their hands in their mouths, and trying not to share our water bottles, but of course, germs tend to find kids wherever kids go! My kids deal with not feeling well in different ways. Gabbie will complain right away, so that we often don’t know if she is just tired or really sick. Zachary will never tell us when he doesn’t feel well to the point where he’ll throw up with no warning! He has also had the strangest illnesses, including a MRSA infection on his ear lobe! (He never mentioned that he’d been hit in the ear with a ball until he developed the infection!) When Simon doesn’t feel well, he tends to just fall asleep. I’ll never forget when he had the flu and couldn’t stay awake when we were supposed to be swimming at an indoor pool – it took me much too long to realize he was actually sick and not just over tired! My favorite ways to overcome sickness include lots of rest (likely while watching TV on the couch), drinking water or tea, chicken soup, and extra attention from Mommy. I will admit that I’m relatively quick to take my kids to the doctor if they have fevers – this year we had a ton of strep going around and both Gabbie and Zachary caught it. I prefer to have them diagnosed sooner than later! Sometimes kids get sick with “just a cold” or “a virus,” meaning the doctor can’t do anything you can’t do at home. For these illnesses, the Pfizer Pediatric Platform products available at Target are a big help. I sometimes find it hard to know what medications are right for my children, so I’m including the descriptions of each of these products direct from Pfizer! Children’s Advil® is a great solution for kids as young as 2 and up to 11 when it comes to easing aches and pains and reducing fevers. It comes in several flavors, including Sugar-free Dye-free Berry, Bubble Gum, Grape, Blue Raspberry, Fruit, and Dye-Free White Grape. There’s also Infants’ Advil® White Grape, which provides fever relief with a syringe for easy dosing for children 6-23 months. 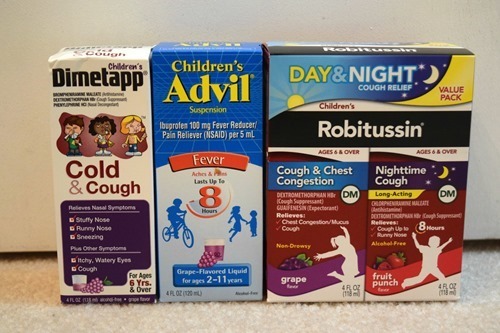 Children’s Robitussin® DM Day/Night Pack (Children’s Robitussin® Cough & Chest Congestion and Children’s Robitussin® Nighttime Cough) is couch medicine formulated just for kids ages 6 and over. The non-drowsy daytime formula helps break up chest congestion, while the long-acting nighttime formula relieves coughs and runny noses to help kids get the rest they need. These comes in grape (daytime) and fruit punch (nighttime) flavors. Children’s Dimetapp® Cold & Cough tackles a child’s most bothersome stuffy and runny noses, all while working to relieve cough. It can be used for children above the age of 6. Dimetapp is also grape in flavor. All of the above links include coupons for these products, and you can access the coupons easily here! These products are all available at Target. It is important to remember to always read and keep the cartons for complete warnings and dosing information on Pfizer Pediatric Platform products and to use as directed! How do you overcome sickness in your house? This post has been sponsored by Pfizer. I received products in exchange for this post.